The Rotherham-based Crawshaw Group Plc, the UK's leading value butcher, has been hit by challenging high street trading conditions and has been forced to make an impairment goodwill of £10.6m. The AIM-listed Hellaby firm reported its financial results for the year to January 28 where group revenue rose 1% to £44.6m but there was an underlying operating loss of £2.0m, an increase from the £1.1m loss reported in 2017. The group also reported a statutory loss before tax of £13.5m, compared with a loss of £1.4m the previous year, due to a one off non cash impairment charge of £10.6m and £0.8m exceptional costs. The company said in a statement that as part of the annual goodwill assessment, forecast future cash flows were adjusted to take into account the impacts of sterling depreciation on buying prices and expected wage inflation. Crawshaw announced growth plans in 2014 that involved investing £200m, opening 200 stores and creating 2,500 jobs. The plans stumbled in 2016 as difficult trading conditions continued. A transformational 2017 deal with the 2 Sisters Food Group enabled Crawshaw to restart its accelerated new store opening programme, with an initial focus on factory shop locations. At the end of January, Crawshaw operated 52 trading stores, opening five new factory shops in the period and closing two underperforming high street units. Sales from factory stores have offset sales from high street locations and the company is transitioning to a model based away from the high street. Now accounting for around a quarter of the group's sales, five to ten new factory stores are planned in the next 12 months. Outgoing chief executive, Noel Collett, said: "This has been a disappointing year for Group sales. Whilst we have been pleased with the strong performance of our factory shop outlets, sales across our high street estate have proven more challenging, exacerbated by the well documented high street pressures. "Against this, however, we have made operational progress to strengthen the business. We are confident that the rollout of our unique factory shops format and improvements in profitability across the high street estate will leave the Group well-placed for future growth." Jim McCarthy, chairman of Crawshaw Group plc, added: "While sales for the year have been challenging, I am confident that the repositioning of the Group towards our successful factory shop model will improve long-term profitability. 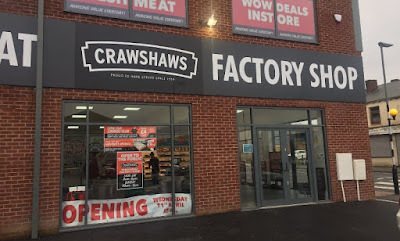 "I expect to provide an update on a new management team in due course, who I am confident will help further develop Crawshaws' market leading value and drive improved performance in both factory shops and high street stores." The report also showed that the company has created a central production capability at the Hellaby factory having invested in automated cutting and packing lines. This should enable a reduction in store-based staff who will re-focus from production to customer service. It also provides the capability to service the wholesale and catering butchery supply routes in the future. A new leadership team is being sought as the CEO and CFO are set to leave the business later this year.